But somehow things still go missing. Averi lost a shoe once and it seriously took us three weeks to find it. Michael lost a hat, and as I type this now, I can’t actually remember if he ever found it. I lost my credit card the other week. It hasn’t turned up yet, but honestly I haven’t been looking that hard. In order to be lazy safe, I just immediately cancelled it and ordered new ones. Yesterday though, an item went missing that trumps all other missing items. Mine and yours. That’s right – yours too. 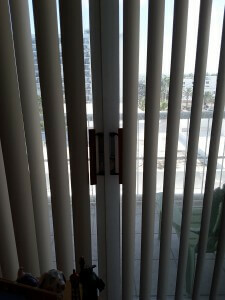 Because the item that went missing is a vertical slat from Averi’s sliding doors. Can you see where it’s missing? It’s the middle one where the two sides meet – you shouldn’t be able to see the two doors joining and the handles. 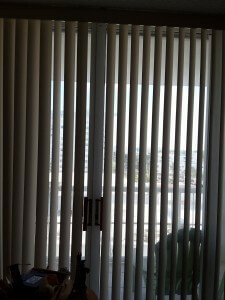 How the hell does a huge vertical blind go missing? Since it obviously can’t, I did the logical thing and accused Averi of somehow ripping it off and then hiding it so she wouldn’t get in trouble. She swore it wasn’t her. I told her that she wouldn’t get in trouble if she admitted it, but that there would be severe trouble if she lied to me. She insisted she didn’t know. 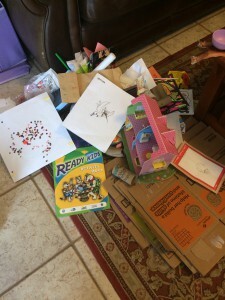 I told her that I would go through her room to find it, and that while I was doing that I would be throwing out any items I deemed to be trash that I came across. In other words, it was in her best interest to fess up. Tears coming down her face, she asked me why I didn’t believe her. 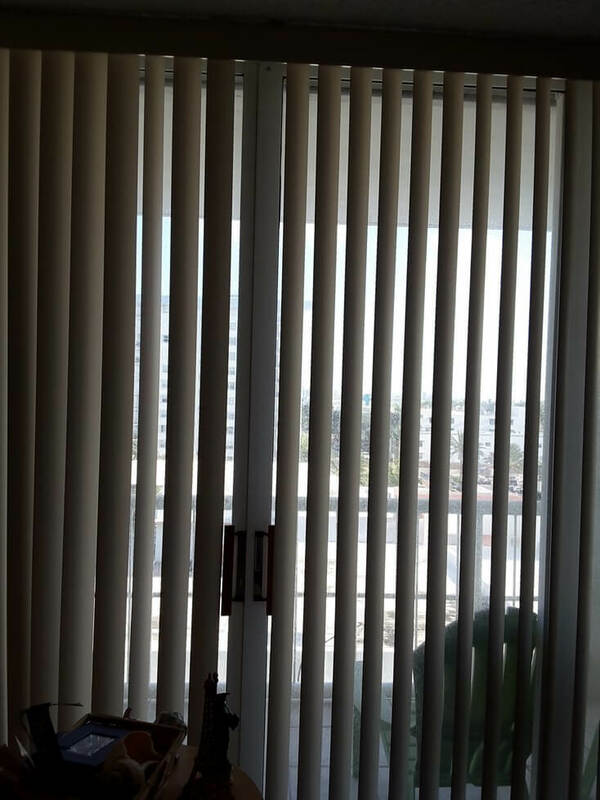 I told her it was because blinds don’t just disappear and I knew I hadn’t done it. We left it there and she went to sleep. So this morning after I dropped her off I started to look for the slat. Her room was actually pretty clean with minimal stuff though, so it wasn’t hard to look for a large vertical slat. And it freaking wasn’t anywhere. Not behind or under her dresser or bed. Not behind her toys bin or doll house. Not pressed up against any baseboards. No where in the closet. I moved onto her bathroom, checking the shower and behind the toilet cabinet thing. No where. I checked the front hall closet. No freaking slat. All the cleaning and organizing was not how I planned on spending my day though. (Side note, my friend Ceci wrote a great piece last week on how quickly kids can change the plans you think you have for a day. Read it here). So I didn’t get to grocery store and had no veggies. No worries, I would swing by garden after school and get kale, tomatoes and fresh herbs and make spaghetti.Â Yeah, the kid struck again. As soon as I picked the kale I hear “mom, I need to pee, now!” Bye bye herbs and tomatoes. So quick and easy Italian Breaded Chicken it is. This recipe is seriously awesome, with only 3 – 4 pantry staple ingredients. 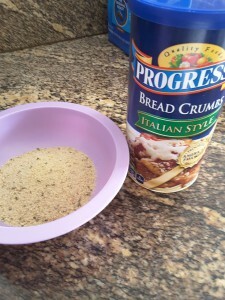 I saw 3-4 because the original recipe calls for bread crumbs with 1 tsp italian seasoning added. I have Italian bread crumbs though, so I skip adding the seasoning. Prep is all of five minutes, cook time is 30. 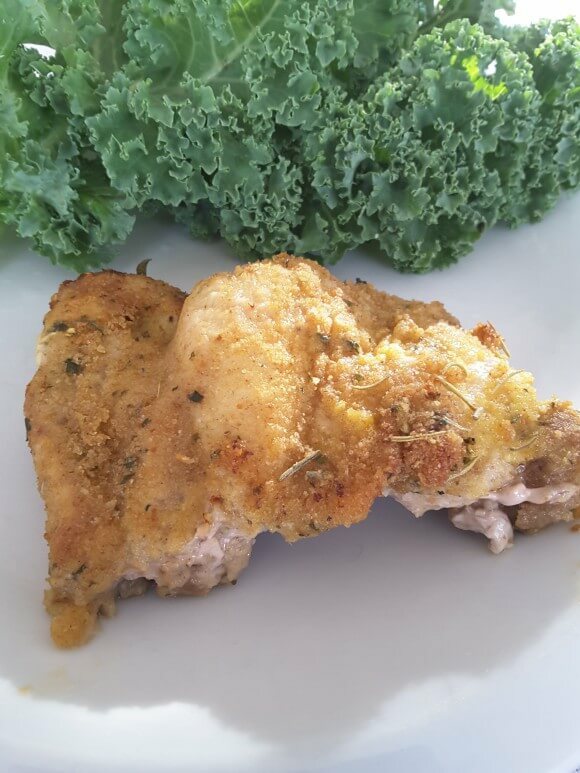 Then delicious moist chicken, with a flavorful lightly crunchy exterior. The kale goes great on the side, and dinner is done. Beat egg in one bowl (shallow pie tins work perfect for this). Mix crumbs and seasoning into second bowl. Dip chicken into egg bowl, then dip chicken into bowl of bread crumbs. Place in greased baking dish. Bake for 25 minutes. Enjoy!